In the first week of July, U.S. net imports of petroleum products fell to just 1.670 million barrels per day (mb/d), the lowest weekly total on record in at least three decades. 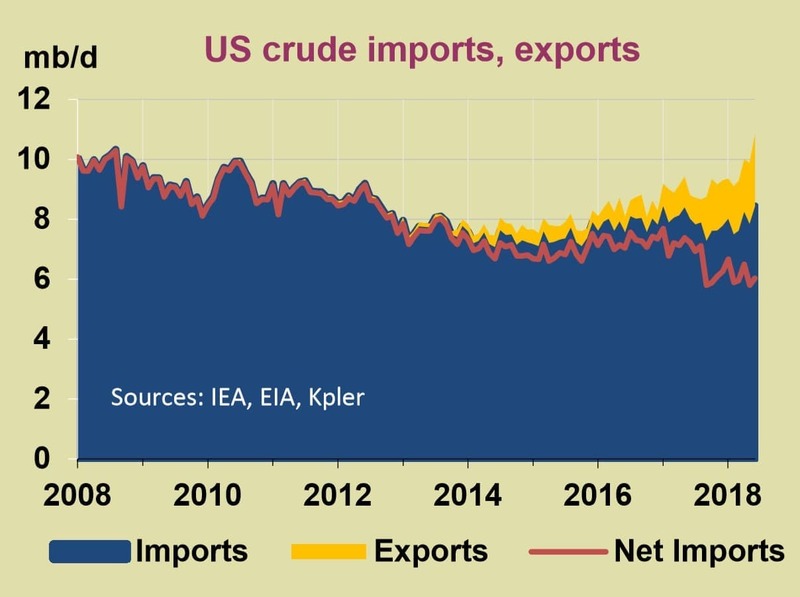 The decline of net imports comes as the U.S. has ramped up oil production in the last few years, which affects the net import figure in two ways. Surging oil output cuts out the need for imports. Also, a steady increase in exports also pushes down the net import figure. Crude oil exports hit a high of 3 mb/d in the third week of June. However, the net import figure has been falling for years, and a large part of that is the fact that the U.S. has been scaling up exports of refined products, including gasoline, distillate fuel oil and propane, among others. This trend dates back longer than the recent run up in crude exports. In 2005, weekly net imports peaked, routinely topping 13 mb/d. Now that figure has plunged to less than 2 mb/d. With a zero net import bill in sight, is the U.S. on the verge of energy “independence,” the long sought-after goal that has been promised by just about every president dating back to Richard Nixon? Not exactly. While the U.S. may not need oil and refined product imports in the same way that it used to, the U.S. is still completely enmeshed and intertwined with the global market. In fact, as output of oil and refined products dramatically increased over the past few years, the volume of trade also rose sharply. “Far from reducing interaction with the world, higher [light tight oil] output has contributed to increased traffic as U.S. refiners seek to diversify their crude slate and producers look for new markets,” the IEA wrote in its latest Oil Market Report. When adding together imports and exports, the total U.S. trade in petroleum products hit 10.8 mb/d in June, the highest monthly total since 2005, dating back to when the U.S. import dependence hit its peak. The reason for this is the oil market is not as simple as consuming exactly what you produce. Texas is gushing light oil, but refiners along the Gulf Coast are better equipped to handle medium and heavy grades. That has oil from U.S. shale increasingly heading overseas. China, for instance, has emerged as a major buyer of U.S. oil. Meanwhile, refiners on the East Coast, for instance, don’t have easy access to all of that oil from Texas. So, they continue to import oil just as before. Still, Gulf Coast refiners are processing as much oil as they can, and indeed, the uptick in domestic oil production has helped fuel a surge in the export of refined products. And as refinery operations have deteriorated in places like Mexico and Venezuela, U.S. refined products have found receptive markets in the western hemisphere. To top it off, U.S. demand, while not growing at a blistering rate, has remain elevated. Imports of oil from Canada have increased steadily over the past three decades. “The US crude oil market is more connected with the rest of the world than at any point in the last 13 years,” the IEA said. Politicians have long argued that producing a ton of oil will free Americans from their dependence on foreign producers. A look at President Trump’s twitter feed will quickly demonstrate the hollowness of that claim. Even as net imports have plunged, the U.S. president has been pleading with OPEC to increase production, a perfect example of how the U.S. remains at the mercy of the global market, regardless of what happens at home. U.S. oil production continues to break records, topping 10.9 mb/d in the last few weeks, an all-time high. Yet, any driver will notice gasoline prices creeping up – the national average is hovering around $3 per gallon, the highest in years. All of that domestic production only helps insofar as it lowers the global price of crude oil. But there is a lot more going on in the world that determines that price than just what is unfolding in Texas. Two sets of figures determine the level of US crude oil imports: one is domestic crude consumption and the second is production. With a US domestic consumption of 20.08 million barrels a day (mbd) in 2018 and a production of 10.8 mbd, the US must import 9.28 mbd to make ends meet. So the claim that net crude imports have plunged to less than 2 mbd couldn’t be correct. If this is the case, then the US couldn’t be on the verge of oil “independence. In 2017 the US imported 10.08 mbd according to the 2018 issue of BP Statistical Review of World Energy. While it is true that the US has been exporting some ultra-light tight oil and refined products, it has also been importing equivalent amounts of medium and heavy crudes for its refineries which are tooled to handle such crudes. Even if hypothetically, the United States becomes self-sufficient in oil, it will never relinquish its economic and geopolitical involvement with global oil. This statement demonstrates intellectual dishonesty of the author. On Twitter Trump just told us about his hint to the Saudis before Russia moves in to replace losses from Iran. When the US achieves its negative oil net import, then this will spell 'total security' from the Persian Gulf bedlam for sure. The trading price on oil is irrelevant here! It may fall to $28 per barrel again. Breaking news: ND Bakken has shattered the prior production peak attained in 2014 and expect further gains in the months ahead. Mr. Salameh makes an interesting point. Since US consumption is about 20mbd and production is under 11mbd, how can net oil imports be so low? Presumably the EIA has some answer to this apparently huge discrepancy. What is it? 7.5 mbpd are exported by the US! 13.5+7.5 = 21 mbpd of "total consumption."